Based on a suggestion by user Sembazuru, we made a video showing you how to use calipers! Digital calipers are fairly straightforward, but it can be a little tricky to read dial and Vernier calipers. Don't worry; we've got you covered. While they are often found in fields like mechanical engineering and metalworking, calipers have their place in electronics as well. Every now and then, I run across a component that has no datasheet, or the datasheet has incomplete information on the required PCB footprint for the part. If I happen to have the component in hand, I can pull out my trusty calipers to take whatever measurements I need from the component. Beyond just PCB layout, they are also extremely useful for taking precise measurements to 3D print enclosures for your electronics, like Nick's Pokédex phone case. I use a set of digital calipers for quick work, but I also have a set of Vernier calipers for when I need reliability in my measurements. Beyond these, what else do you like to use calipers for? Any tips or tricks you can offer for taking good measurements? Friday Product Post: Super Tsunami! Came across a GREAT tip a while back to measure the center to center spacing for 2 (same sized) holes. Use the calipers to measure the inside opening of one hole, then zero the calipers whilst making this measurement. Effectively now all measurements will have this distance subtracted. Now measure the outside to outside distance of the 2 holes and the reading will now represent the center to center spacing. This only works of the holes are the same size though, but still extremely useful tip. Awesome! I actually struggle trying to take accurate center-to-center measurements of holes, so this'll come in handy. I believe you omitted a step in the ZERO PROCEDURE, one should always clean the outside measurement jaws prior to performing a zero. A lint free cloth should be used. This is a step we teach our students here at the college and its often overlooked, a bit of pocket lint or debris from the workbench can easily give you incorrect measurements. Good call, thanks for the tip! Calipers are never an improvised adjustable wrench!!! Truth, although I hear that you can use the sharp edges to mark your material, if you're careful. high quality calipers that are actually made from hard metal. The scratch that one can make with the caliper points is very faint, so it shows up better with the contrast of marking blue. not directed at anyone specific, just don't do it. If you're taking requests, I'd love to see you break down everything there is to know about wiring. There's a Sparkfun tutorial on wire/connectors, but I feel like it just scratches the surface. I'd love to see a deep dive into: - What are the different types of wire available? Why should I use one over the other? Solid, stranded, different insulators, gauges, ribbon, bundles, etc... - Best practices for making your own wire bundles - Everything you ever wanted to know about heat shrink - Waterproofing and wiring - Choosing the correct gauge for a project... - How do I shop for multiple conductor wire? And where would one shop for that? - What kinds of connectors are out there, and how do you hook those up/crimp them on? NASA has a published standard for wiring that I saw recommended on a FIRST robotics site. Good idea, thanks! Not to spoil too much, but I know that Pete was working on a video involving wiring tips. It was a good suggestion, so I hope it helps people! I've never actually used the step measurement, so thanks for the tip. I would normally just go for the depth gauge for something like that, but I can see how it would be better than relying on the somewhat flimsy depth rod. As I said, I also usually forget about it. But the times that I do remember to use it I find my measurement is less fiddly to take. Calipers are definitely easier to use than micrometers, and for many purposes, are accurate enough. Each has things that they are better at than the other. As for the batteries, mine seem to last on the order of a year, though I don't use the calipers all that much. My suggestion is to keep a spare. I think I'd find an "external battery" to be excessive in the weight department. As a side light, I bought my first calipers (I'd been using micrometers) about 20 or so years ago when I was reloading ammunition. 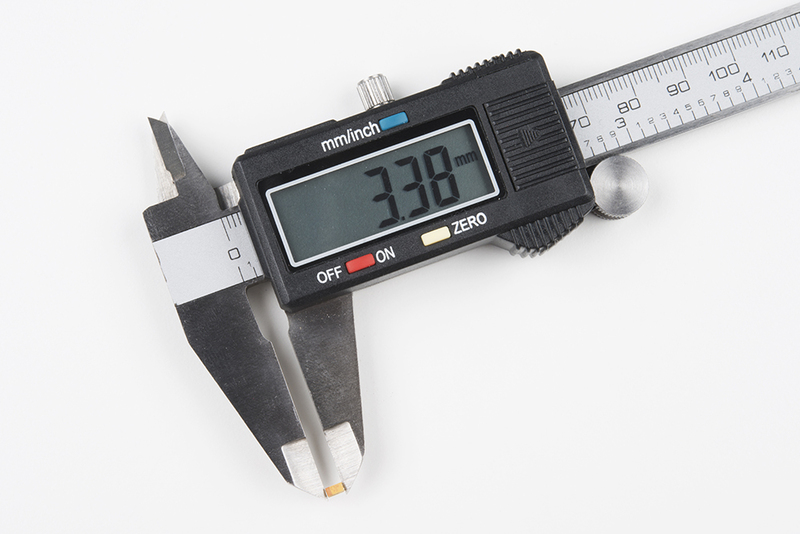 One advantage of calipers over micrometers is the large range -- from 0 to 6" (or 12") in a single instrument. I may have to do a micrometers tutorial in the future, but I rarely use them. I find that my calipers do most of the heavy lifting. As for the pronunciations, I've heard several ways. As it turns out, we're both (technically) wrong :) The accent should be on the first syllable: https://www.merriam-webster.com/dictionary/vernier. One thing I forgot to mention: when using a vernier (no matter how you pronounce it!) if the zeros line up exactly with the fixed marks, you use the fixed mark even with the left zero, and tack a zero on after it. This is a good explanation of how to use calipers. I would also add that calipers will only provide accurate measurements if they have been calibrated against a standard in a metrology lab. For most people that really isn't a requirement, and they can get away with using them off the shelf. If you drop your calipers, know that they can no longer be relied on unless tested with gauge blocks. One last thing, when taking measurements, the jaws have to be perpendicular to the measured surface for an accurate reading. After adding the external battery do you find the extra bulk gets in the way of some readings? Not usually. No more than having a giant dial or some other piece protruding from the face of the slider.